The Aliph Jawbone line of Bluetooth headsets has been a stand-out since its 2007 U.S. introduction, combining leading noise reduction with aggressive styling. And the new Jawbone ICON is another significant step forward, not only boosting the noise reduction technology and supporting downloadable apps to customize your experience, but also taking advantage of features found in other headsets to make the ICON simpler and more fun to use. The Jawbone designs historically have a unique look, bulging out to touch your face with a small nub that acts as a voice activity sensor, allowing the Jawbone to more accurately separate your voice from the background noise. But the Jawbone's historical focus on style also made it something of an acquired taste, best targeted for connoisseurs who were heavy users of wireless headsets. For example, the controls were "invisible," with the buttons embedded under the outside shield, and so needed to be learned with experience and burnt into your muscle memory. And the Jawbones used a proprietary charging cable that fit with the minimized design, so you needed to bring along an extra charger and cable on trips. The Jawbone Prime, introduced in mid 2009, began breaking down these idiosyncrasies by incorporating traditional noise reduction technology that no longer required that the touch voice sensor always be pressed securely to the side of your face (see earlier post). And now the Jawbone ICON further opens the design to a broader range of users by offering simpler controls and a broader range of helpful features. 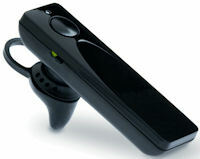 These begin with simpler and clearer controls, now with a dedicated on/off switch and a distinct Talk button to control the call connection. Plus, the ICON uses the standard microUSB connector for easier charging. As another assist, the ICON provides voice announcements to speak information, including the caller ID phone number and the battery level. It also displays the remaining battery life on the iPhone status bar. And it now supports simultaneous multipoint, so you can switch between two calls from two different phones at same time. For more fun, the ICON supports MyTALK software updates, downloadable apps to enhance and customize your experience. These include Bluetooth A2DP streaming audio, AudioApps to change the voice and language, and DialApps for a customized easy access button. Finally, the ICON further steps up the Jawbone NoiseAssassin technology for background noise elimination and wind noise reduction, combining dual microphones and the voice activity sensor to better isolate the best audio. It also has enhanced the inbound audio quality, including adjusting the volume to a consistent level. The Jawbone ICON is available for $99 (to $80 street), in six designs and a range of colors. The Jawbone Prime also is available for $89 ($60 street). The ICON is a welcome enhancement that makes the traditional Jawbone technology easier to use and more helpful to a broader range of users. iPod owners have lots of choices for accessories, especially to share their music with portable speakers. You can plug in to the headphone jack to connect an external speaker like the Altec Lansing Orbit-MP3 Portable Speakers (see earlier post). Even better, you can take advantage of the iPod connector to nest your iPod right into the speakers, with no separate cables required. For example, the Altec Lansing inMotion Compact Speakers have a clean design that combines portability with powerful sound. The general form is roughly rectangular, 9.5 x 4.7 x 1.8 in., with a clever "leather-like" cover that wraps around to protect the face, or folds back as a stand. Then insert your iPhone or iPod in the center slot, and enjoy the music -- with two 2-inch full-range neodymium drivers for full-spectrum audio and two front-firing ports for powerful bass. You can control your iPhone or iPod from the power and volume buttons along the top of the speakers. Or plug in another audio source with the auxiliary 3.5mm input jack. The inMotion Compact runs on AC power or on batteries (4 AA batteries provide up to 24 hours of playback). And it also recharges your iPhone or iPod. The Altec Lansing inMotion Compact Speakers provide great sound in a relatively portable package that you can feel comfortable packing up for travel. They're available for around $79, or $63 street price. See my Audio Accessories Gallery for more on portable speakers and earphones. Bluetooth headsets certainly have become more sophisticated with audio processing to work amazingly well in noisy environments. And newer devices like the Aliph Jawbone ICON (see earlier post) add support for features including voice prompts, streaming audio playback (A2DP), and multipoint connections (multiple simultaneous devices). So Bluetooth headsets are not only getting smart, but they are charged through the same USB cable as your smartphone, which opens the door for upgrading and customizing. The usual method of updating small single-purpose devices is through firmware downloads, but this is a new era of apps, so why not bring apps to your ear? For example, the Jawbone ICON supports a variety of MyTALK apps for customizing the voice and options. Another approach is to take better advantage of the fact that the smartphone and headset are already communicating over Bluetooth. After all, if you can control your TV from your smartphone with apps like Verizon FiOS Mobile (see earlier post), why not also use your smartphone to provide better access to customizing the headset? So check out the new Sound ID 510 Bluetooth headset, with its EarPrint iPhone app, available in the iTunes Store. With the app you can customize your listening preferences, check the battery level, and monitor a sound level meter. And you can adjust the sound quality and listening levels even while you are on a call. The Find Me option also starts the headset beeping. As a side benefit of having the iPhone app to set options, the Sound ID 510 can have simplified controls, with just an on/off switch, one button (for answer / end / redial / voice dial), and the volume control. But there's no volume button or toggle -- Instead, the face of the headset is touch sensitive, so you change the volume just by sliding your finger. Sound ID also has other interesting ideas for its headsets, like the earlier Sound ID 400 with separate remote microphone, so you can listen to a sound source from a distance (see earlier post). The Sound ID 510 takes an interesting approach to making a small device more accessible without adding complexity to the device itself. It's now available in black for $129. It includes three sizes of RealComfort earloops, plus an options ear hook. The EarPrint iPhone app is a free download. USB provides a handy interface to easily add speakers to your laptop, as with products like the Logitech Clip-on USB Laptop Speakers (see earlier post), and Altec Lansing Orbit USB Portable Speakers (see earlier post). But you can also feed audio in the other direction, with sound flowing into your computer from a USB microphone. With plug and play ease, you then can turn your laptop into an audio recording station, for interviews or podcasts or even performances. There's no drivers or specials software required -- just fire up your favorite audio recording software. But you still need a quality mic, and preferably a flexible mic that can be used in a variety of situations. This is the idea behind the Blue Microphones Yeti USB Microphone, part of a family of innovative and interestingly-named audio recording equipment from Blue. The key innovation in the Yeti design is the use of three internal condenser microphone capsules, which allow you to customize the pickup pattern for different recording situations. Turn the pattern selector switch on the mic to choose stereo recording, or to select one of three polar patterns: Cardioid to capture a single source (e.g., vocals, podcast, voiceover), Omnidirectional for groups (musicians, conversation, conference table), or Bidirectional for front and rear (musicians with presence, interview). For example, we used the cardioid setup to record voiceover for video, since we did not want room ambience. The Yeti delivered excellent sound quality, with great presence in the recorded voice that required very little post-processing to fit with the video. The Yeti provides additional handy controls, with master volume, mute, and microphone gain. And it has a headphone output jack for real-time monitoring with a volume control, along with the mini USB jack. The Yeti should work well with almost any standard recording software. It's flexibility is in the recording pattern -- the recording format itself is fixed at 48 kHz, 16 bit digital audio format. It's also not particularly portable at 3.4 pounds with the stand -- the mic itself is 1.2 pounds, with a threaded mount for a mic stand. You can't just carry the Yeti around and hope to record something on the spot. But it's great for quick setup on your desk for recording podcasts and other voice work, and certainly transportable for other similar work at other controlled locations. The Blue Microphones Yeti is a quality mic (it's THX Certified) that provides recording versatility and good sound quality with quick and easy USB plug and play connection, for around $149. You'll find it to be the quickest / easiest / best-sounding option for a variety of recording projects. See my Audio Accessories Gallery for more on audio components and portable speakers. The range of the video editing software market has been remarkably stable over the past decade or so, with a clear divide between "consumer" tools in the $50 to $100 to $150 range, and "professional" tools from the likes of Adobe, Apple, Avid and Sony, starting at around $700 to $800. Even better, these technologies not just for the high end -- New capabilities are flowing down even more quickly from the professional tools into the consumer tools, and at the same time some of the interface improvements are propagating up from the entry-level tools. So "consumer" no longer means "beginner" for video editing. Consumers no longer want to be limited to an easy step-by-step tool. Instead they want access to the kinds of effects they see on television, with multi-track editing and lots of effects. And professional tools provide more creative freedom from more precise controls, deeper integration with pro cameras and capture equipment, optimized performance for heavy-duty editing, and a focus on the entire end-to-end workflow, including integration with a larger suite of tools. Also see my Video Editing Software Gallery for more on consumer and professional products. Entries posted to Manifest Tech Blog in August 2010, listed from oldest to newest.